Bored of the dating game? Happy Hour, not so festive? Maybe you need to dive into Bar Bingo! Liven up your bar-fly ways with this old school favourite. Earn points from spying! 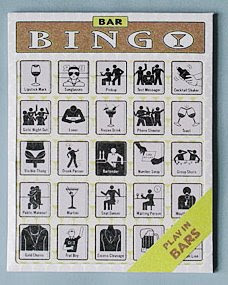 Pick ups, drunk customers, off-putting PDA, martinis ~ all earn you points on your Bingo board. Ignoring your date was never so much fun! I want! I could so use that on boring nights out with the Einsteins. Who knew watching a rugby match could erupt into a debate over which people are the worst: the Welsh or the French. That bar bingo would have been so much more fun.